Once Oman a Time: A Tale of India Escaping China’s “String of Pearls"
Once Oman a Time: A Tale of India Escaping China’s “String of Pearls”? The meeting between the leaders of China and India in April 2018 appeared to indicate a thaw in relations between the two powers. However, the security deal India signed with Oman in February allowing its navy access to the port of Duqm may suggest otherwise. Only a few years ago, a group of Chinese investors had pledged to help build a new $10 billion industrial city to transform the small Omani town, with major facilities including an oil refinery and an automobile plant. The overlapping ambitions of both countries in Oman signals an increasingly heated struggle for influence in the Indian Ocean. The agreement gives Indian vessels the ability to dock and undergo maintenance at a strategic point near the Persian Gulf, 1,600 kilometres west of Mumbai. The expanded military footprint it offers Delhi coincides with attempts to bypass its rivals, China and Pakistan, in building an economic corridor to Central Asian and European markets via Iran. The primary channel is the port of Chabahar, just off Oman’s northern coast. The Duqm deal offers India the ability to more readily secure this route and serves as further evidence of its bid to break free of the so-called “string of pearls” it believes China is constructing around it. In recent years, India has intensified efforts to re-engage with regional partners hitherto regarded as securely within its own camp, such as Sri Lanka, Nepal and the Maldives. Many of these countries have diversified their interests by playing off India and China against one another. For all India’s aspirations, China’s regional designs far outweigh its own. Beijing’s Belt and Road Initiative (BRI) investments, around the China-Pakistan Economic Corridor ports of Gwadar and Karachi, dwarf Indian investments. Though these projects are allegedly commercial in nature, there are reports that China intends to build a military base on the Pakistan coast. When viewed from this angle, the Chinese regional strategy of converting economic influence into hard power poses a direct challenge to Delhi’s historic predominance in what it considers its own neighbourhood. The Duqm deal was signed at a precipitous moment for Oman. For decades the reign of its septuagenarian current ruler, Sultan Qaboos, was noted for its remarkable calm, especially in view of the political and social upheaval in other Arab states. The Arab Spring in 2011 was largely bypassed in Oman due to a hike in public spending, though the crash in the oil price between 2014-16 marked a severe downturn in the country’s finances. 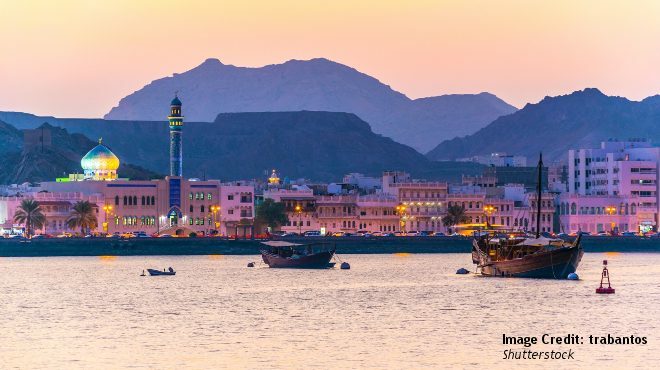 Oman’s budget deficit, though reduced over the past few years, is still forecast at over 10 percent in 2018, a level considered unsustainable. With oil prices currently well below their peak, the economy’s overreliance on the commodity leaves it dependent on external investment. This makes Oman a ripe target for the competing interests and chequebooks of China and India. Oman is unique in many respects in the Arab world. Most of its citizens are adherents of the Ibadi branch of Islam, allowing it to naturally straddle the traditional Shia-Sunni divide. Its geographic location on the edge of the Persian Gulf and Indian Ocean has also historically given it a broader outlook than many other Middle Eastern countries. These characteristics meant it was well-positioned to act both as a broker for the Iran nuclear deal, and to remain neutral during the Saudi-led blockade of Qatar. Muscat’s standing offers an attractive diplomatic foothold for China and India in the Middle East, as both seek to engage more proactively with the Islamic world. Many of the companies in the Chinese consortium spearheading Duqm’s development, Oman Wanfang, have their roots in Ningxia province, which has a large Muslim population keen on boosting links with Arab nations. Building friendly relationships with Islamic countries like Oman can only be beneficial as China seeks to soothe relations with its own restive Muslim minority population in provinces such as Xinjiang. India is also looking to move past its own difficulties with Muslim-majority Pakistan, with Oman acting as a potential bridge to other regional states such as Afghanistan and Iran. India may be some way behind matching China’s economic influence, but its current and potential military alliances in the Indian Ocean, such as the revived Quad consisting of itself, the U.S., Japan and Australia pose a serious challenge to Chinese ambitions. China’s foreign policy also suffers from competing priorities, especially to its east, where more pressing concerns on the Korean Peninsula, Taiwan and in the South China Sea absorb its energies. India, by contrast, benefits from a local advantage, with the Duqm military deal indicating an emerging willingness to counter the recent activities of China in nearby states such as the Maldives. The Duqm agreement is not a pivotal moment for the balance of power in the Indian Ocean. Rather, it represents another phase in the contest between China and India. Where once Beijing’s increasing influence may have surprised potential opponents, the enormity of its challenge is now evident. China has shed its decades-old policy of rising subtly by instead loudly trumpeting its BRI projects and promoting its political and economic model as an alternative to those offered by the West. The enormous credibility it has staked on this plan suggests it is likely to vigorously protect its investments. India has shown in Oman that it intends to frustrate China’s moves, and to deploy its military forces more readily abroad. Those seeking to analyse China and India’s future relations in the Indian Ocean would do well to closely watch the continued rivalry unfolding in the Sultanate.